This article is about the year 1984. For the novel by George Orwell, see Nineteen Eighty-Four. For other uses, see 1984 (disambiguation). Brunei becomes a completely independent state. The Bell System in the United States is broken up. January 3 – President of the United States Ronald Reagan meets with Navy Lieutenant Robert Goodman and the Reverend Jesse Jackson at the White House, following Lieutenant Goodman's release from Syrian captivity. January 7 – Brunei becomes the sixth member of the Association of Southeast Asian Nations (ASEAN). The United States and the Vatican (Holy See) restore full diplomatic relations. The Victoria Agreement is signed–institutionalising the Indian Ocean Commission. January 18 – The Mitsui Miike coal mine explosion at Ōmuta, Fukuoka, Japan, kills 83. January 22 – The Los Angeles Raiders defeat the Washington Redskins, 38-9, to win Super Bowl XVIII in Tampa, Florida. The game's broadcaster, CBS, runs Apple Computer's iconic 1984 advertisement for the Macintosh personal computer. Apple places the Macintosh on sale in the United States two days later. Dr. John Buster and the research team at Harbor–UCLA Medical Center announce history's first embryo transfer from one woman to another, resulting in a live birth. February 8–19 – The 1984 Winter Olympics are held in Sarajevo, Yugoslavia. February 22 – President of Bangladesh, H M Ershad upgraded South Sylhet's sub-division status to a district and renamed it back to Moulvibazar. David Vetter (aka The Boy in the Plastic Bubble) a prominent sufferer of Severe combined immunodeficiency dies aged 12. February 23 – TED (conference) founded. February 26 – The United States Marine Corps pulls out of Beirut, Lebanon. February 29 – Canadian prime minister, Pierre Trudeau, announces his retirement. March 6 – A year-long strike action begins in the British coal industry (see UK miners' strike (1984–85)). March 14 – Sinn Féin's Gerry Adams and three others are seriously injured in a gun attack by the Ulster Volunteer Force. The United States Central Intelligence Agency station chief in Beirut, William Francis Buckley, is kidnapped by the Islamic Jihad Organization and later dies in captivity. Gary Plauche fatally shoots his son Jody's sexual abuser, Jeff Doucet, at Baton Rouge Metropolitan Airport in Louisiana. March 22 – Teachers at the McMartin Preschool in Manhattan Beach, California are charged with Satanic ritual abuse of the school children; the charges are later dropped as completely unfounded. March 23 – General Rahimuddin Khan becomes the first man in Pakistan's history to rule over two of its provinces, after becoming interim Governor of Sindh. Saint Pope John Paul II consecrates the world to the Immaculate Heart of Mary, in Fátima, Portugal. The Institute of the Incarnate Word (IVE) is founded under Fr. Carlos Miguel Buela. April 1 – Death of Marvin Gaye: Marvin Gaye is shot to death by his father, a day before his 45th birthday. April 9 – The 56th Academy Awards, hosted by Johnny Carson, are held at the Dorothy Chandler Pavilion. Terms of Endearment wins Best Picture and four other Academy Awards. April 12 – Palestinian gunmen take Israeli bus number 300 hostage. Israeli special forces storm the bus, freeing the hostages (one hostage, two hijackers killed). April 13 – India launches Operation Meghdoot, bringing most of the disputed Siachen Glacier region of Kashmir under Indian control and triggering the Siachen conflict with Pakistan. Welsh comedian Tommy Cooper suffers a massive heart attack and dies while live on TV. The first World Youth Day gathering is held in Rome, Italy. April 16 – More than one million people, led by Tancredo Neves, occupy the streets of São Paulo to demand direct presidential elections during the Brazilian military government of João Figueiredo. It is the largest protest during the Diretas Já civil unrest, as well as the largest public demonstration in the history of Brazil. The elections are granted in 1989. Diretas Já demonstration held in São Paulo. April 17 – WPC Yvonne Fletcher is shot and killed by a secluded gunman, leading to a police siege of the Libyan Embassy in London. April 23 – United States researchers announce their discovery of the AIDS virus. April 24 – An X-class solar flare erupts on the Sun. April 25 – The term of Sultan Ahmad Shah as the seventh Yang di-Pertuan Agong of Malaysia ends. April 26 – Sultan Iskandar of Johor, becomes the eighth Yang di-Pertuan Agong of Malaysia. The International Garden Festival opens in Liverpool. South Africa, Mozambique and Portugal sign an agreement on electricity supply from the Cahora Bassa dam. The Herreys' song Diggi-Loo Diggi-Ley wins the Eurovision Song Contest for Sweden in Luxembourg. The Itaipu Dam is inaugurated on the border of Brazil and Paraguay after nine years of construction, making it the largest hydroelectric dam in the world at the time. Denis Lortie kills three government employees in the National Assembly of Quebec building. The Chicago White Sox defeat the Milwaukee Brewers 7-6 in the longest game in Major League Baseball history: 25 innings totalling eight hours, six minutes. May 12 – The Louisiana World Exposition, also known as the 1984 World's Fair, opens. May 13 – Severomorsk Disaster: an explosion at the Soviets’ Severomorsk Naval Base destroys two-thirds of all the missiles stockpiled for the Soviets’ Northern Fleet. The blast also destroys workshops needed to maintain the missiles as well as hundreds of technicians. Western military experts called it the worst naval disaster the Soviet Navy has suffered since WWII. May 19 – The Edmonton Oilers win The Stanley Cup, beating the defending champion New York Islanders by 4 games to 1. May 23 – A methane gas explosion at Abbeystead water treatment works in Lancashire, England, kills 16 people. May 27 – An overnight flash flood rages through neighborhoods in Tulsa, Oklahoma. Nearly 15 inches (38 cm) of rain falls in some areas over a four-hour period; 14 people are killed. May 31 – Six inmates, including James and Linwood Briley, escape from a death row facility at Mecklenburg Correctional Center, the only occasion this has ever happened in the United States. June 3 – Ronald Reagan visits his ancestral home in Ballyporeen, the Republic of Ireland. June 4 – Bruce Springsteen releases his 7th album Born in the U.S.A.
June 6 – Tetris is officially released in the Soviet Union on the Electronika 60. A deadly F5 tornado nearly destroys the town of Barneveld, Wisconsin, killing nine people, injuring nearly 200, and causing over $25,000,000 in damage. Ghostbusters and Gremlins are released. June 12 – In one of the greatest NBA Finals ever, The Boston Celtics beat the Los Angeles Lakers in 7 games to capture their 15th NBA Championship. June 16 – The world-renowned, critically acclaimed Canadian entertainment company, Cirque du Soleil is founded. June 18 – Colorado radio host Alan Berg is shot dead outside his home in Denver by members of The Order. The official name of the Turkish city of Urfa is changed into Şanlıurfa. June 27 – France beats Spain 2–0 to win Euro 84. June 28 – Richard Ramírez (the "Night Stalker") murders his first confirmed victim. June 30 – John Turner becomes Canada's 17th prime minister. June 30 – Elton John plays the famous Night and Day Concert at Wembley Stadium. Liechtenstein becomes the last country in Europe to grant women the right to vote. Argentinian footballer Diego Maradona is sold by FC Barcelona (Spain) to S.S.C. Napoli (Italy) for a world record fee at this date of $10.48M (£6.9M). July 13 – Terry Wallis, a 19-year-old living in the Ozark Mountains of Arkansas, falls into a deep coma after a severe automobile accident; he will eventually awaken 19 years later on June 13, 2003. July 14 – New Zealand Prime Minister Rob Muldoon calls a snap election and is defeated by opposition Labour leader David Lange. Beverly Burns becomes the first female Boeing 747 captain in the world. In San Ysidro, San Diego, 41-year-old James Oliver Huberty sprays a McDonald's restaurant with gunfire, killing 21 people before being shot and killed himself. July 19 – 1984 Llŷn Peninsula earthquake. The largest instrumentally recorded inland earthquake ever to take place in the British Isles is felt in Ireland and each of the four British nations. July 27 – Metallica releases their second studio album Ride the Lightning. The African republic Upper Volta changes its name to Burkina Faso. Soviet submarine K-278 Komsomolets reaches a record submergence depth of 1,020 meters. United States President Ronald Reagan, during a voice check for a radio broadcast remarks, "My fellow Americans, I'm pleased to tell you today that I've signed legislation that will outlaw Russia forever. We begin bombing in five minutes". Barefoot South African runner Zola Budd, controversially granted British citizenship earlier in the year, and Mary Decker of the U.S. collide in the Olympic 3,000 meters final, neither finishing as medallists. August 16 – John DeLorean is acquitted of all eight charges of possessing and distributing cocaine. 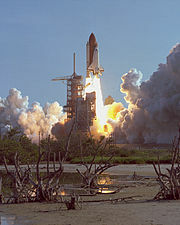 The launch of shuttle, Discovery, on STS-41-D, its first mission. September 2 – Seven people are shot and killed and 12 wounded in the Milperra massacre, a shootout between the rival motorcycle gangs Bandidos and Comancheros in Sydney, Australia. The Progressive Conservative Party of Canada, led by Brian Mulroney, wins 211 seats in the House of Commons of Canada, forming the largest majority government in Canadian history. STS-41-D: the Space Shuttle Discovery lands after its maiden voyage at Edwards Air Force Base in California. September 7 – An explosion on board a Maltese patrol boat disposing illegal fireworks at sea off Gozo kills seven soldiers and policemen. September 10 – Jeopardy! begins its syndicated version, with present-day host Alex Trebek. September 14 – Joe Kittinger becomes the first person to fly a gas balloon alone across the Atlantic Ocean. September 16 – Edgar Reitz's film series Heimat begins release in Germany. September 23 – Threads airs on BBC Two. September 24 – The 1970s-1980s TV family sitcom Happy Days is cancelled from broadcast. September 27 – Alex Deforce, a Belgian multidisciplinary artist is born in Kortrijk. October 20 – Monterey Bay Aquarium is opened to the public after seven years of development and construction. October 23 – The world learns from moving BBC News television reports presented by Michael Buerk of the famine in Ethiopia, where thousands of people have already died of starvation due to a famine, and as many as 10,000,000 more lives are at risk. October 25 – The European Economic Community makes £1.8 million available to help combat the famine in Ethiopia. October 31 – Assassination of Indira Gandhi: Prime Minister of India Indira Gandhi is assassinated by her two Sikh security guards in New Delhi. Anti-Sikh riots break out, leaving 10,000 to 20,000 Sikhs dead in Delhi and surrounding areas with majority populations of Hindus. Rajiv Gandhi becomes Prime Minister of India. October 31 – Galileo forgiven by Vatican for work on the Earth orbit 368 years after being condemned. November 4 – The Sandinista Front wins the Nicaraguan general elections. United States presidential election, 1984: Republican President Ronald Reagan defeats Democratic former Vice President Walter F. Mondale with 59% of the popular vote, the highest since Richard Nixon's 61% popular vote victory in 1972. Reagan carries 49 states in the electoral college; Mondale wins only his home state of Minnesota by a mere 3,761 vote margin and the District of Columbia. Former U.S. Secretary of State and eventual 2004 presidential nominee John Kerry gets elected as the Democratic U.S. Senator from Massachusetts, and was in office until 2013, when he resigned to become the Secretary of State, succeeding Hillary Clinton. November 11 – The Louisiana World Exposition, also known as The 1984 World's Fair, and also the New Orleans World's Fair, and, to the locals, simply as "The Fair" or "Expo 84", closes. Band Aid (assembled by Bob Geldof) records the charity single Do They Know It's Christmas? in London to raise money to combat the famine in Ethiopia. It is released on December 3. Uruguayan presidential election, 1984: Julio María Sanguinetti is democratically elected President of Uruguay after 12 years of military dictatorship. November 30 – Kent and Dollar Farm massacres: the Tamil Tigers begin the purge of the Sinhalese people from North and East Sri Lanka; 127 are killed. December 1 – Controlled Impact Demonstration: NASA and the FAA crashes a remote controlled Boeing 720. December 2 – Australian federal election, 1984: Bob Hawke's Labor Government is re-elected with a reduced majority, defeating the Liberal/National Coalition led by Andrew Peacock. Bhopal disaster: A methyl isocyanate leak from a Union Carbide pesticide plant in Bhopal, Madhya Pradesh, India, kills more than 8,000 people outright and injures over half a million (with more later dying from their injuries the death toll reaches 23,000+) in the worst industrial disaster in history. Hezbollah militants hijack a Kuwait Airlines plane and kill 4 passengers. December 8 – White supremacist and Order leader Robert Jay Mathews is killed in a gun battle and fire during an FBI siege on Whidbey Island. December 10 – Cisco Systems is founded. 1983–85 famine in Ethiopia intensifies with renewed drought by mid-year, killing a million people by the end of this year. Crack cocaine, a smokeable form of the drug, is first introduced into Los Angeles and soon spreads across the United States in what becomes known as the crack epidemic. The Chrysler Corporation introduces the first vehicles to be officially labeled as "minivans". They are branded as the Chrysler Town & Country, Dodge Caravan, and Plymouth Voyager. The novel Nineteen Eighty-Four by George Orwell, published in 1949, is set in this year. The video game Grand Theft Auto: Vice City Stories takes place in 1984. The Transformers franchise starts in 1984 with the Transformers toy line. Metal Gear Solid V: The Phantom Pain takes place in this year. The Terminator takes place in May of this year. The Saturday school detention of The Breakfast Club takes place on March 24, 1984. Season two of the Netflix original television show Stranger Things takes place in 1984. ^ "United States-Vatican Diplomatic Relations: The Past and The Future". The Ambassadors REVIEW. Council of American Ambassadors. Spring 2001. Archived from the original on October 25, 2012. Retrieved November 17, 2011. On January 10, 1984, when President Reagan announced the establishment of formal diplomatic relations with the Holy See, he appointed William A. Wilson, who had been serving as his personal representative to the Pope, as the first US Ambassador Extraordinary and Plenipotentiary to the Holy See. ^ "Zila". Moulvibazar.com. January 2016. Retrieved September 4, 2018. ^ "Features and Events". astro.hopkinsschools.org. ^ "Snapshot: Maradona is toast of the town after signing for Napoli". The Times. London. February 20, 2012. Retrieved March 30, 2013. ^ "1984: Zola Budd in race trip controversy". On This Day. BBC. August 11, 1984. Archived from the original on January 23, 2008. Retrieved March 3, 2013. ^ "1984: Extent of Ethiopia famine revealed". BBC News. October 23, 1984. Retrieved January 22, 2013. ^ "1984: Europe grants emergency aid for Ethiopia". On This Day. BBC. Retrieved January 22, 2013. ^ "Vatican Science Panel Told By Pope: Galileo Was Right". The New York Times. November 1, 1992. ISSN 0362-4331. Retrieved April 12, 2017.